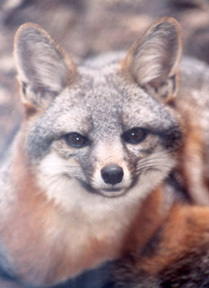 The Santa Catalina Island fox became endangered when an outbreak of disease, believed to be canine distemper, killed over 85% of the population in just a few years. To help prevent such catastrophic events in the future, biologists across the Channel Islands use the late summer and early fall to count island foxes and give them health checks. In September, Friends of the Island Fox went out in the field with Julie King, fox biologist for the Catalina Island Conservancy as she did health checks on wild island foxes. Click to Listen to Island Fox Talk Podcast in the field with Julie King as she examines a young female island fox. 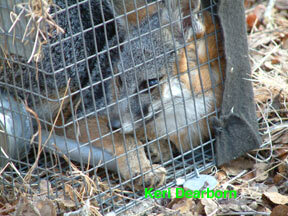 taking the weight - The island fox is weighed while still in the trap. visual check of teeth, coat - Teeth are checked for wear and breakage (this female fox was under 2 years old but had a broken tip on an upper canine tooth); the coat is examined for overall heath and the presence of parasites, fleas and ticks. 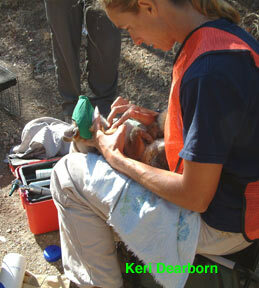 ear exam - An otoscope is used to look in the fox’s ears. The biologist is looking for ear mites, inflammation and disease. 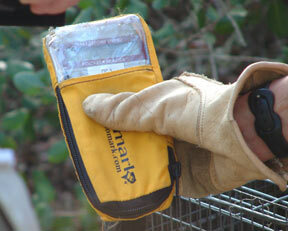 vaccinations - Island foxes receive vaccinations to help reduce the chance of disease. 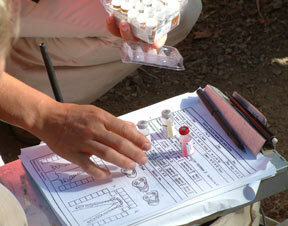 drawing a blood sample - The blood sample provides additional information on health and possible disease exposure. A mask is put over the foxes eyes to reduce the animal's stress while being handled by humans. How was the island fox caught for the health check? The island foxes on Santa Catalina are increasing in number, but a new threat is causing them problems, ear mites. 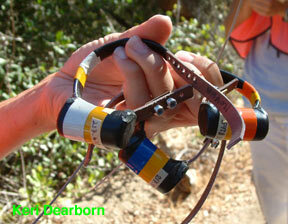 Cancerous tumors are forming in the ears of island foxes on Catalina. The relationship between the ear mites and the cancer is currently being studied. Friends of the Island Fox would like to help the Catalina Island Conservancy in their quest to solve this mystery that is posing a new danger to island foxes. You can help by making a donation through the "Pay Pal" or "Donate Now" buttons at the top right of the page. Through generous donations Friends of the Island Fox has funded 17 radio collars in the past 2 years so island foxes can be monitored in the wild. Your donation to Friends of the Island Fox helps fund conservation efforts across all of the Channel Islands to help save the island fox. 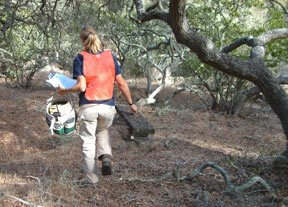 If you are a fox biologist on the Channel Islands, late summer through early autumn is a busy season. 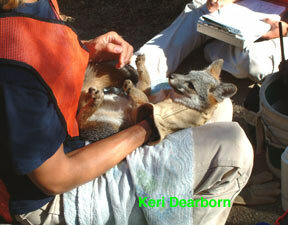 During this short window of time, island fox populations are counted and individual animals receive health check-ups. To get their hands on these pint-sized, but sharp-toothed predators, special box-type traps are put out in specific areas. 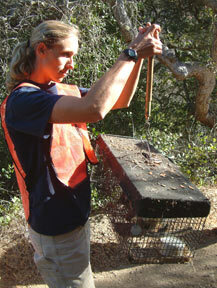 In September, Friends of the Island Fox rode along with Julie King, fox biologist for the Catalina Island Conservancy. 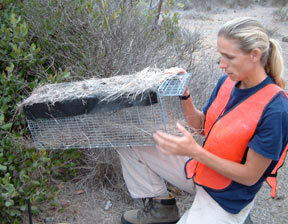 The day on Santa Catalina Island started very early, because all of the traps on a string must be checked before the day starts to get warm. The fox is first identified by its “pit tag.” A scanner responds to the microchip tag and displays the animals identification number. Endangered island foxes on Santa Catalina, San Miguel, Santa Rosa and Santa Cruz islands are given microchip identification tags like those you would use on your pet dog. The fox in the trap is scanned with the microchip reader to identify it. In this way, the biologist knows when the fox was last caught and whether or not it needs vaccinations, a health check or radio collar maintenance. If the fox does not have a microchip or pit tag, it will receive one. If it has already been caught this season and has had its health check, the biologist will release the fox and reset the trap. If not, then the island fox will spend 15-20 minutes with the biologist getting a full health workup. Join us November 20th for an audio podcast as biologist Julie King does a health check on an island fox.